Jacob D. Goering, Ph.D., professor, psychologist, and beloved community volunteer, died January 12, 2019, on his 101st birthday, at Kidron Bethel Village, North Newton, Kansas. Jacob – also known as Jake – was born January 12, 1918, on the family farm in Lone Tree Township, Kansas. He was the fifth of nine surviving children of Christian B. and Adina Goering, members of the Swiss-Volhynian Mennonite community there. From early childhood, Jacob had a drive to seek learning and explore worlds beyond the farm. After graduating from Moundridge High School in 1935, he set his sights on attending Bethel College in North Newton. His parents encouraged his pursuit of higher education, although Jacob had to work hard to pay the costs of attending, taking time off to work through his college years to earn tuition and support himself. He graduated with a major in history and psychology in 1941. Jacob credited his Bethel education with providing a foundation for his later accomplishments. 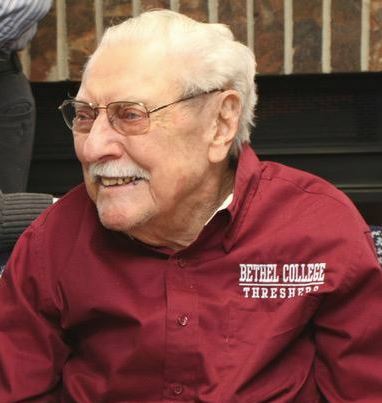 He remained a loyal Bethel alumnus for the rest of his life. At Bethel he met his future wife, Beth Eldridge, of Kansas City, Missouri. They were married in 1941 and remained a devoted couple for nearly 70 years, until her death in 2011. As a registered conscientious objector during World War II, Jacob served as assistant director of forest service CPS camps in Oregon and California. Beth served beside him as camp dietician for much of that time. After the war, Jacob, Beth and their growing family moved to Chicago, where Jacob earned a B.D. at Bethany Seminary and began his graduate education at the University of Chicago in the new field of human development. Jacob postponed his graduate studies to take a job as psychologist at Brook Lane Farm, a Mennonite-affiliated psychiatric hospital in Smithsburg, Maryland. While working at Brook Lane Farm, Jacob learned that faculty from the University of Chicago were starting a new department of human development at the Institute for Child Study in the University of Maryland’s College of Education. With Beth’s support, he resumed his graduate work at the University of Maryland while working full time at Brook Lane Farm. He obtained a fellowship at the university in 1957, and the family moved to Silver Spring, Maryland. Jacob received his doctorate in 1959 and remained at the university as a professor in the Institute for Child Study until his retirement. During his years as a professor, Jacob provided guidance and encouragement to many graduate students. In 1964 he and his family lived in Berlin, where Jacob had a Fulbright lectureship. Jacob retired from the university in 1983 as Professor Emeritus. In the early 1970s, Jacob and Beth developed an interest in the psychology of C.G. Jung. Jacob took leave from the University of Maryland, and they went to Zurich to study at the C.G. Jung institute. Jacob received his Diploma in Analytical Psychology from the Jung Institute in 1978. He began a private psychotherapy practice, certified professionally in Maryland, which he maintained after retirement from the university and until he and Beth moved to Kansas in 1996. Upon moving to live at Kidron Bethel Village in North Newton, Jacob began his third career as an involved and inspirational community volunteer. Most notably, Jacob became a leader in the effort to raise funds for, develop, and maintain a walking trail through a neglected shelterbelt along Sand Creek on the Bethel College campus. The Sand Creek Trail has become a well-loved North Newton landmark. Jacob also led the successful effort to get a state historic marker at the site of the old Lone Tree landmark along the Santa Fe Trail in Elyria, Kansas, near his birthplace. Jacob was involved in many other local activities and projects during his years at Kidron Bethel. He received service awards and recognition from the North Newton Community Foundation, LeadingAge Kansas, and the City of North Newton. Jacob received the Bethel College Distinguished Achievement Award in 2001. During his last years in the health care section of Kidron Bethel, Jacob remained involved in all the events and activities there, and accumulated many Senior Olympics medals. Jacob Goering is survived by children J. Daniel Goering (Marian) of Albuquerque, New Mexico; Kathleen McMahon (Kevin), of Columbia, Maryland; and Barbra Goering (James Murray), of Chicago, Illinois; sister Evelyn Lehman (Ralph) of North Newton; five grandchildren; and seven great-grandchildren. A memorial service will take place on Saturday, March 23, at 11:00 a.m. at Bethel College Mennonite Church, North Newton, Kansas.